Work with businesses to implement smoke-free policies in the workplace. Employ counter-marketing and media advocacy strategies to combat tobacco industry influence. 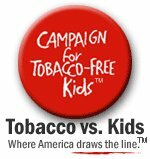 Provide information to state and local policy makers and community members regarding current issues in tobacco control.